Cross-Sectional Area: 50.3 sq. in. This chimney cap is an economical alternative for preventing downdrafts. It is made of heavy-duty 24-gauge 304-alloy stainless steel, and is appropriate for use with relining pipe as well as sealed-end factory-built chimneys. Use of this item will not cure non-wind related draft problems. Note that when using WindBeater on a fireplace flue, you must use a size with a cross-sectional area appropriate for the fireplace. This cap has an 8" round inside flue size and a cross-sectional area of 50.3 square inches. It carries a manufacturer's lifetime warranty. Can you order these in a different color? No, the Windbeater is available only in stainless steel. I have a wood stove in my basement. 8 inch metal fab chimney pipe. Would this attach properly? That is a friction fit 8" ID chimney cap and, yes, it will fit an 8" ID flue. Will this HomeSaver 8 inch round windbeater stainless steel chimney cap work as a rain guard as well? Yes, the cap is designed to prevent rain from entering the chimney system. The end of this cap is crimped down to allow it to fit into a 7 5/8 inch pipe or larger. As such, it should work for your application without an issue. Does this have a spark arresting screen in it? This manufacturer offers a bird guard, but no spark arrestor for this product. 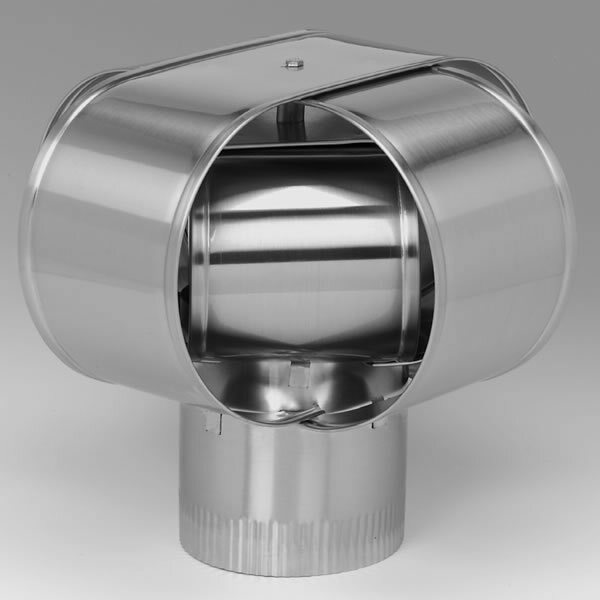 A spark arrestor would need to be fabricated to surround the cap or a screen could be installed inline with the chimney flue beneath the cap. Will I be able to clean the soot and creosote out of this when it gets full? Yes. The internal baffle can be removed from this cap relatively easily, which helps to facilitate the cleaning of your flue and the cap itself.